The EMD SD70 is a series of diesel-electric locomotives produced by Electro-Motive Diesel in response to the GE Dash 9-44CW. Production commenced in late 1992[page needed] and since then over 5,700 units have been produced; most of these are the SD70M and SD70MAC models. All locomotives of this series are road switchers with C-C trucks, while the SD70ACe-P4 has a B1-1B wheel configuration. Prior to the SD70ACe and SD70M-2 models, all SD70 models were delivered with the self-steering HTCR radial truck. [note 1] The radial truck allows the axles to steer in curves which reduces wear on the wheels and railhead. With the introduction of the SD70ACe and SD70M-2 models, EMD introduced a new bolsterless non-radial HTSC truck as the standard truck for these models in an effort to reduce costs. The HTCR-4 radial truck is still an option. All SD70ACe and SD70M-2 locomotives are, from the factory, equipped with one Nathan Airchime K5LLA-R1L airhorn mounted on a high-profile base. Due to height clearance restrictions, production models of the SD70ACe-T4 will be equipped with one K5LLA airhorn, mounted on a low-profile base, facing forward, and one "dual tone" K-13B airhorn, mounted over the rear headlight, facing rearward. The SD70 uses the smaller standard cab or spartan cab, common on older 60 Series locomotives, instead of the larger, more modern comfort cab. This makes it hard to distinguish from the nearly-identical SD60, the only difference being the use of the HTCR radial truck instead of the HT-C truck mounted under the SD60. The main spotting feature is the difference in length between the two models - the SD60's 71 feet, 2 inches vs. the SD70's 72 feet, 4 inches. The SD70 also rides higher as its frame is approximately 1⁄2 inch (13 mm) higher than the SD60's. This model is equipped with direct current (DC) traction motors, which simplifies the locomotive's electrical system by obviating the need for computer-controlled inverters (as are required for alternating current (AC) power). It is equipped with the 4,000 horsepower (3,000 kW), 16-cylinder EMD 710 prime mover. One hundred and twenty-two examples of this model locomotive were produced for Norfolk Southern Railway (NS), Conrail (CR), Illinois Central Railroad (IC) and Southern Peru Copper Corporation (SPCC). Conrail's assets were split between Norfolk Southern (PRR) and CSX Transportation in 1999, and all 24 of Conrail's SD70 units went to NS. Other than the CR paint scheme these units were built to NS specifications and numbered (2557 - 2580) in series with their SD70's. Production of the standard cab at EMD's London, Ontario plant ended in 1994. The 24 Conrail SD70s were assembled from kits at Conrail's (later NS's) Juniata Shops in Altoona, Pennsylvania, and the IC and SPCC SD70s were assembled from kits at Super Steel Schenectady. All SD70s are still in service with Norfolk Southern and Canadian National (CN), which merged Illinois Central in 1999. In February 2017, NS began a program to convert their SD70s from DC to AC, which will also have a new wide cab, and several other upgrades. They will be designated as SD70ACC. The SD70M has a wide nose and a large comfort cab (officially known as the "North American Safety Cab"), allowing crew members to ride more comfortably inside of the locomotive than the older standard cab designs. There are two versions of this cab on SD70Ms: the Phase 1 cab, which was first introduced on the SD60M, and the Phase 2 cab, which is a boxier design similar to the original three-piece windscreen on the SD60M, which is shared with the Phase 2 SD90MAC, SD89MAC, and SD80ACe. The Phase 2 cab has a two-piece windscreen like the Phase 1 windscreen but the design of the nose is more boxy, with a taller square midsection for more headroom. The SD70M is equipped with D90TR DC traction motors and the 710G3B prime mover. [page needed] They are capable of generating 109,000 lbf (480 kN) of continuous tractive effort. [page needed] From mid-2000, the SD70M was produced with SD45-style flared radiators allowing for the larger radiator cores needed for split-cooling. Split-cooling is a feature that separates the coolant circuit for the prime mover and the circuit for the air pumps and turbocharger. There are two versions of this radiator: the older version has two large radiator panels on each side, and the newer version has four square panels on each side. This modification was made in response to the enactment of the United States Environmental Protection Agency's (EPA) Tier 1 environmental regulations. Also the truck was replaced with HTCR-4, instead of HTCR-I on former model. Production of the SD70M ceased in late 2004 as production of the SD70M-2 model began (the EPA's Tier 2 regulations went into effect on 1 January 2005). 1,609 examples of the SD70M model were produced. Purchasers included CSXT, New York Susquehanna & Western (NYSW; part of EMDX order no. 946531), Norfolk Southern and Southern Pacific (SP; now part of the Union Pacific Railroad), but the vast majority were purchased by Union Pacific. An order of SD70Ms made history when Union Pacific ordered 1000 units of the model (UP 4000 through UP 4999, inclusive). This order was later extended by nearly 500 additional units (UP 3999, and below) and (UP 5000, and above). This locomotive model is also built for export, and is still catalogued by EMD (at 4,300 hp or 3,200 kW). CVG Ferrominera Orinoco has 6 SD70Ms that were built as an add-on order to UPs FIRE cab equipped SD70Ms. Companhia Vale do Rio Doce (CVRD) in Brazil has ordered 55 of this model for service in Carajas pulling trainloads of iron ore. Since CVRD track is gauged at 1,600 mm (5 ft 3 in), a wider bogie, the HTSC2, was designed for these units by EMD. 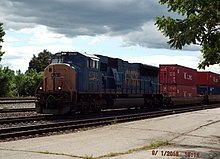 The SD70I is a version of the SD70M which has been fitted with a cab that is isolated from the frame of the locomotive with rubber gaskets (officially known as a "WhisperCab"). The isolation reduces noise and vibration from the prime mover. A seam is visible across the nose and on the long hood where the cab connects with the body. 26 examples of this model locomotive were produced, all for Canadian National Railway. The WhisperCab feature was incorporated into some SD70MAC’s. The WhisperCab was standard on the SD80MAC’s and SD90/43MAC’s. The SD70MAC (colloquially known as a "Mac" or a "70 Mac") is very similar to the SD70M and SD70I; the main difference being that the SD70MAC uses AC traction motors. Production of the model commenced in 1993, competing against GE's AC4400CW. [page needed] AC motors, while simpler and more reliable than DC motors, require expensive inverters to generate a variable-frequency AC signal, raising the locomotive's purchase cost substantially. The majority of SD70MAC models were produced with the 4,000 horsepower (3,000 kW) EMD 710 prime mover while later units are rated at 4,300 horsepower (3,200 kW) and feature EMD SD45-style flared radiators. The Alaska Railroad ordered their locomotives with head-end power to make them suitable for both freight and passenger service. No other railroad ordered this variant. The trucks were replaced with HTCR-4, instead of HTCR-I on former model. CSX 4761 with EMD SD45-style flared radiators leading a stack train. The SD70MAC is no longer produced due to EPA regulations, and was replaced by the SD70ACe in 2004. In total, 1,109 SD70MACs were produced, purchased by Burlington Northern Railroad (and its successor, BNSF Railway), Conrail, CSX Transportation, Transportación Ferroviaria Mexicana (TFM; units now owned by Kansas City Southern Railway (KCS)), and the Alaska Railroad. Metra has approved of a purchase of 15 SD70MACs for passenger service, with options of up to 27 more. They will be designated as SD70MACH. BNSF Railway SD70ACe no. 8794 coupled to an SD70MAC, providing a good comparison of the two models. The SD70ACe is the successor to the SD70MAC. Introduced in 2004, the SD70ACe was originally designed to comply with EPA Tier 2 locomotive emissions regulations. Beginning in 2012, newly built SD70ACe's were EPA Tier 3-compliant. [page needed] SD70ACes are equipped with EMD's 16-710-G3C-T2 prime mover, rated at 4,300 horsepower (3,200 kW); later Tier 3 models are rated at 4,500 horsepower (3,400 kW). They are rated at 157,000 lbf (700 kN) continuous tractive effort (191,000 lbf (850 kN) starting). Braking effort is rated at 106,000 lbf (470 kN). Although mechanically similar to earlier SD70 units, the SD70ACe rides on a new underframe and uses mostly new sheet metal above the frame. Electrical cables and air lines have been routed beneath the walkways on opposite sides, allowing easier access for maintenance. Continuing the designs of the SD80 and SD90 series, the radiator on the locomotive is nearly as wide as the cab, the center hood section is a step down below the roofline, and the dynamic brakes have been moved to the rear of the hood. The SD70ACe uses the cab design of late-model SD90MAC-H units, which uses rectangular window glass and is externally different from the two cab variations used on earlier SD70M and SD70MAC units. In 2008, EMD standardized the isolated cab on subsequent SD70ACe's after non-isolated cab units were restricted from leading on the BNSF Railway due to excessive cab vibration. Purchasers included ArcelorMittal, BNSF Railway, Canadian National Railway, CSX Transportation, Ferromex, Kansas City Southern Railway, Montana Rail Link, Norfolk Southern Railway, CVG Ferrominera Orinoco, Union Pacific Railroad, Quebec North Shore and Labrador Railway, BHP Billiton, and shortline Arkansas and Missouri Railroad. In 2012, EMD also built four models known as the SD70ACe-P6. These units, unlike previous SD70ACe's, have one inverter per axle on the trucks, rather than EMD's traditional one inverter per truck design. Four of EMD's SD70ACe-P6 demonstrators were sold to Canadian National Railway, numbered 8100-8103, and all have been repainted into company paint. In 2014, BNSF Railway took delivery of 20 SD70ACe-P4 units, numbered 8500-8519. This model was designed with a B1-1B wheel arrangement to compete with GE's ES44C4 model, which has an A1A-A1A wheel arrangement. Two of EMD's demonstrator SD70ACe-P4's went to Tacoma Rail in late 2014 for a 5-year lease. On January 1, 2015, the United States Environmental Protection Agency's Tier 4 locomotive emission regulations went into effect. EMD could not successfully modify the SD70ACe's 2-stroke 710 series prime mover to be Tier 4-compliant; thus, the Tier 3 SD70ACe was succeeded by the SD70ACe-T4 in late 2015. However, US production of the Tier 3-compliant SD70ACe continues with Tier 4 'credit units' (new Tier 3-compliant units EMD is entitled to build based on previously-earned emissions credits). Union Pacific and Norfolk Southern are currently the only US roads to own Tier 4 credit unit SD70ACe's. Additionally, EMD has continued building Tier 3 SD70ACe's for Ferromex (4100-4118), Ferrosur (4119-4133), and Kansas City Southern de Mexico (4200-4224) at Bombardier's Ciudad Sahagun, Mexico plant. These locomotives are restricted to Mexico-only operation and cannot cross the US border (just as Canadian National's newest Tier 3 GE ES44AC's are restricted to Canadian use only). In March 2016, EMD replaced the standard cast HTCR-4 trucks on NS SD70ACe 1000 with the new fabricated HTCR-6 trucks for testing. UP and BNSF plan to test the new HTCR-6 trucks on some of their SD70ACe units also. Union Pacific Railroad received 273 additional SD70ACe units in 2014 and 2016. These are referred to as SD70AH, H for Heavy, because they are ballasted to 428,000 lbs instead of the standard "ACe's" 420,000 lbs. Union Pacific 4141 is a special SD70ACe commissioned in honor of George H. W. Bush, the 41st President of the United States. The locomotive wears a paint scheme that is based on that of Air Force One. Lettering reading "George Bush 41" is painted on the sides in honor of the George Bush Presidential Library and President Bush. The locomotive was in regular service from its unveiling in 2005 until being stored in the North Little Rock shop as a result of the financial crisis of 2007–2010, although it briefly returned to service in 2012. However, after Bush's death on November 30, 2018, UP 4141 was brought out of storage and participated in the funeral train for the late president on December 6, running from Spring, Texas to College Station, Texas. The SD70M-2 is a DC traction version of the SD70ACe, and is nearly identical to the SD70ACe. Production began in 2005. [page needed] SD70M-2 models are equipped with the 16-710G3C-T2 prime mover which is rated at 4,300 horsepower (3,200 kW). The SD70M-2 was not a big seller, as most major carriers were purchasing AC traction locomotives exclusively by the time of its introduction. Only 331 SD70M-2's were built. Canadian National Railway owns 190 units, and 130 units are owned by Norfolk Southern Railway. 8 units owned by Electro-Motive Diesel and 3 units owned by CIT Financial were leased by Florida East Coast Railway until early 2015. Canadian National 8964 was the last SD70M-2, built in February 2011. The SD70ACe-T4 is the Tier 4 emissions standards-compliant version of the SD70ACe. The first locomotive, EMDX 1501, was built in summer 2015, and made its debut at the Railway Interchange Expo in Minneapolis, Minnesota during the weekend of October 3–4, 2015. It features a new 4-stroke engine called the EMD 12-1010 "J" series - a V12 with 1010 cu.in displacement for each cylinder. This new prime mover has a two-stage turbocharger system consisting of three turbos; one turbo (the primary/high pressure turbo) for low-mid RPM and two turbos (the secondary/low pressure turbos) for mid-high RPM. The results of this setup are higher power throughout a broader RPM range, better fuel efficiency, and lower emissions. An EGR system is applied as well, allowing the engine to achieve Tier 4 without the use of urea aftertreatment. Another new feature of this engine is the Double-Walled Fuel Injection System that increases safety and provides simplified maintenance works. The EMD 12-1010 is capable of producing 4,600 hp, but only 4,400 tractive horsepower. With a new computer software for the on-board computer and one inverter per axle (or "P6"; EMD named it "Individual Axle Control") - unlike most of previous EMD locomotives that use one inverter per truck, the SD70ACe-T4 is capable of generating 200,000 lbf. (889.64 kN.) of starting tractive effort, and 175,000 lbf. (778.75 kN.) of continuous tractive effort. Meanwhile, its dynamic braking effort is as much as 105,000 lbf. (467.25 kN.) The amount of starting tractive effort is equal to that of the 6,000 hp SD90MAC-H while, on the other hand, its continuous tractive effort is higher than that of the SD90MAC-H (175,000 lbf. vs. 165,000 lbf.). The units are also equipped with "radial bogies" which offer increased adhesion and better ride quality. While it retains the basic SD70 designation, the locomotive has several major new features that set it apart from its successful ancestor such as a vibration-isolated powertrain, and alternator start capability. In addition, it features a newly redesigned cab reminiscent of the earlier SD70M, featuring the classic "teardrop" windshields first introduced on the FP45 in December 1967; new fabricated trucks; a longer frame (76 ft. 8 in / 23.37 m); longer radiators with three radiator fans instead of two; an additional step on the front and rear; and a smoother long hood roofline. Fifteen SD70ACe-T4 demonstrators were built at Muncie, IN by November 2016. Union Pacific Railroad is the first customer to order SD70ACe-T4's. UP 3012-3014, the first production SD70ACe-T4's, were assigned to active service in early November 2016. Union Pacific will acquire 100 SD70ACe-T4's: 12 former demonstrators will be rostered as UP 3000-3011, and 88 production units (3012-3099). 3012-3056 were built at Bombardier's Sahagun, Mexico plant. 3057-3099 will be built at Muncie, IN, following completion of the Tier 4 credit SD70ACe's UP 8997-9096. All UP SD70ACe-T4's will be classified as SD70AHs. EMDX 1501 will remain in Progress Rail Services ownership as a test bed. SD70ACeP4-T4's EMDX 1603 and 1604 were built and painted as demonstrators for the BNSF Railway. These units have a B1-1B wheel arrangement akin to the SD70ACe-P4. As of August 2018, Norfolk Southern and CSX Transportation have each ordered 10 SD70ACe-T4's. In 2004, BHP Billiton ordered a first batch of 14 SD70ACe/LCi locomotives for use on iron ore trains in the Pilbara region of Western Australia. [page needed] It operated in 2015 a fleet of 23 SD70ACe/LCi locomotives beside of 142 standard SD70ACe, from which the newest locomotives are built in 2014. The first member of the class (4300) was purchased for parts and dismantled upon arrival in Australia. This was because it was cheaper to purchase a complete locomotive than buy the components individually. The first batch of SD70ACe/LCi's (4301-4313) was ordered in 2004 and named after sidings on the BHP system. [page needed] Since it did not have the newer, isolated cab of the second and subsequent batches it was traded in to the supplier for locomotives with newer cab assemblies. The second batch of locomotives (4314-4323) arrived between August and November 2006. An additional 18 units (numbers 4356-4373) were delivered in the second half of 2010, bringing the total of SD70ACe type locomotives in service to 72. In March 2012, BHP Billiton ordered a further 80. In July 2012 fellow Pilbara operator, Fortescue Metals Group, took the delivery of the first of a fleet of 19, later extended to 21 (701-721). In 2018, some BHP SD70ACE/LCis were sold to Montana Rail Link. The SD70ACS is a 4,500 horsepower (3,400 kW) AC variant for heavy haul freight, used in desert environments. The first 25 units were ordered for Saudi Railway Company in April 2009 and assembled in the London, Ontario plant for delivery in the second half of 2010. Special features include a pulse filtration system, movable sand plows, EM2000 control system and FIRE display system. Mauritania's Société Nationale Industrielle et Minière placed a contract for six SD70ACS locomotives in October 2010. In July 2011 Etihad Rail ordered seven SD70ACS locomotives for delivery in 2012. In October 2015, EMD started producing SD70ACe-BB locomotives for Brazilian narrow gauge railroads. The SD70ACe/45 is a diesel-electric locomotive built by EMD plant in Sete Lagoas, MG Brazil. Different from the SD70ACe in North America, the SD70ACe/45 has a longer frame (76 ft. 6 in.) and three radiator fans on the radiator section since it uses the same car body of the SD80ACe produced by EMD plant in London, Canada to Vale mining in Brazil. It uses 1,600 mm (5 ft 3 in) gauge. 80 SD70ACe/45s had been built. In early 2019 with the delivery of the new SD70ACE-T4C locomotives to Norfolk Southern, a new type of the T4C locomotives was rolled out of Progress Rail in Muncie, Indiana. The SD70IAC, SD standing for Special Duty, 70 standing for 70 series, and IAC standing for Individual Axle Control. They are still classified as SD70ACE's on the side of the locomotive but in the computer says SD70IAC. The new IAC system betters the existing traction system. The SD70ACe/LW is a diesel-electric locomotive built by EMD. Similar to the SD70ACe in North America in the rear, it features a new isolated cab similar to the flat nosed cab of the GT46-ACE GEN II. The SD70ACe/LW has a 16-710G3C-T2 prime-mover with 4,500 horsepower. It uses an AC traction system with a top speed of 74 mph(120 kph). The SD70ACe/LW is 16 feet and 6 inches tall. 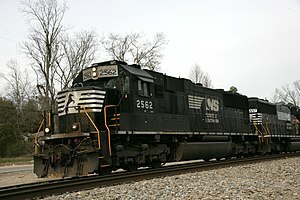 The SD70ACU was first built by EMD and later rebuilt by Norfolk Southern. It is originally an SD90MAC (or well known as SD9043MAC) that has been rebuilt to renew its electrical components and replace the cab with the new EMD Phase-II cab to comply with the most recent safety requirements. These locomotives are similar to the SD70ACe model, but the main body features are all reminiscent to the SD90MAC features. They also have the latest EMD cab that meets current FRA crashworthiness standards. These locomotives also have the Ultra Cab II, locomotive speed limiter (LSL), and cab signals. 100 of the 110 units Norfolk Southern purchased were originally SD9043MACs previously operated by the Union Pacific Railroad. The other 10 units were acquired by a trade with Cit Group for MP15DC's. All NS-owned SD9043MACs are slowly being rebuilt by NS at its shops in Altoona, Pennsylvania. As of March 29, 2019, 108 SD70ACU units have been completed and released to active service. Canadian Pacific has also began a program to convert their SD90MAC units into SD70ACUs. The SD70ACC is the latest rebuild in Norfolk’s Southern's DC to AC program. It has the new EMD safety cab, similar to the SD70ACe cab, but with the “teardrop windshield”, much like the SD70ACe-T4. The SD70ACC has been rebuilt with AC traction motors, an AAR-style control stand, an electrical cabinet with Mitsubishi electronics, a new main alternator, and additional weight to increase the maximum weight to 432,000 pounds. The SD70ACC is rated at 4,500 horsepower (3,355.649 kilowatts), has a fuel capacity of 4,900 gallons, and has dynamic braking, cab signals, and LSL (Locomotive Speed Limiter). Norfolk Southern is rebuilding its fleet of SD70s into SD70ACC specifications. The first two units, 1800 and 1801, were unveiled in a special yellow and grey paint scheme to promote the DC to AC program, similar to the paint schemes used on the first GE AC44C6M. As of January 2019, eleven units have been rebuilt and have since been released to service, with many more units undergoing rebuild. 5 SD70ACe units, numbered 9001-9005. Delivered in May 2013. 28 SD70MAC units, numbered 4001-4016 and 4317–4328. The units numbered 4317–4328 have flared radiators for Tier 1 compliance and are equipped with head-end power (HEP) generators for passenger service. 3 SD70ACe units, numbered 70-72. Units are ex-EMDX 1201-1203. 786 SD70MAC units, numbered 8800–8989, 9400–9499 and 9504–9999. Unit 8876 was retired and scrapped following a wreck. Units 9400–9716 are ex-Burlington Northern Railroad. 9400-9579 are built without the isolated cab while 9580-9716 are built with the isolated cab. Some 9500 series MACs were sold to PRLX in 2017. 640 SD70ACe units, numbered 8400-8499, 8520-8599, 8749-8799, 8990-9158, & 9160-9399. 9159 wrecked, rebuilt, and renumbered 8749. 26 SD70I units, numbered 5600–5625. 190 SD70M-2 units, numbered 8000–8024 & 8800–8964. All units are equipped for Distributed Power operation. 4 SD70ACe-P6 units, numbered 8100-8103. Units are ex-EMDX 1206, 1208-1210. Also set up for Distributed Power operation. 30 SD70ACU units, numbered 7000–7029 on order from Progress Rail. To be rebuilt from CP SD9043MAC's. CP have 28 additional SD9043MAC's stored. 3 SD70M-2 units, numbered 140–142. All are ex-EMD demonstrators. 25 SD70M units, numbered 4675–4699. All are ex-EMD demonstrators. All units were sold to Progress Rail (PRLX) in mid 2018. Originally 220 SD70MAC units, numbered 4500–4589 and 4701–4830. Unit 4716 wrecked and retired in 2014. Units numbered 4575–4589 are ex-Conrail units. 16 of CSX's SD70MAC locomotives (units 4501-4506, 4510-4512, 4516-4520, 4522 & 4523) were sold to Four Rivers Transportation, 16 of which went to the Paducah & Louisville Railway and its subsidiary, the Evansville Western Railway (EVWR 4517, 4519 and 4520). PAL repainted three SD70MACs in special livery: one in University of Kentucky Blue & White colors to mark the school's 2012 NCAA Basketball Championship (PAL 2012, ex-4505). They painted a second unit into University of Louisville Red & White to mark their 2013 NCAA Basketball Championship (PAL 2013, ex-4506). The third special unit, PAL 4522, is also painted in University of Kentucky blue and white, and commemorates all 8 of UK's championship wins. All units are used in regular freight service, between Paducah and Louisville,KY. 20 SD70ACe units, numbered 4831–4850. 4839 retired due to an alternator failure. All retired in 2017 and sold to Progress Rail (PRLX), 4834 vandalized with C&O lettering in April 2018. 3 SD70ACe units, numbered 1207, 2012, & 4223. 1207 is an SD70ACe-P4. 1 SD70ACe-T4 unit, numbered 1501. 97 SD70ACe units numbered 4000–4096. 34 SD70ACe units numbered 4100-4133, built in 2015. These units are not Tier 4 compliant and are thus restricted to Mexico. 4119-4133 are assigned to Ferrosur, and are specially equipped with experimental sheet-metal awnings or "elephant ears" over the radiator air intakes to combat excess heat and enhance engine cooling in the many tunnels through which they must operate. 8 SD70M-2 units, numbered 100–107. All eight units were returned to lessor in early 2015. Former FEC 100 & 102 now Providence and Worcester Railroad 4301 & 4302, respectively. Former FEC 101 & 103 now Vermont Railway 431 & 432, respectively. 40 SD70 units, numbered 1000–1039. Units 1006, 1013, 1014 & 1023 were wrecked and retired. 75 SD70MAC units, numbered 3900–3902, 3904–3905, 3907, 3910–3916, 3918, 3920–3921, 3924–3926, 3928–3930, 3932, 3934–3935, 3937–3938, 3941–3942, 3944, 3946–3948, 3951, 3953, 3955, 3957, 3961–3964, 3966–3968, 3970, 3972–3973. All are ex-Transportación Ferroviaria Mexicana (TFM) units. 153 SD70ACe units, numbered 3997–4059, 4100–4129, & 4140-4199. Units 3997–3999 are ex-EMD demonstrators. 75 SD70ACe units, numbered 4060–4099, 4130-4139, & 4200-4224. Units 4200-4224, built in 2015, are not Tier 4 compliant and are thus restricted to Mexico. 2 SD70ACe units, numbered 5308 & 5309. Units are ex-EMDX 1204 & 1205 respectively. 25 SD70ACe units, numbered 4300–4315 & 4400-4408. 80 SD70 units, numbered 2501–2580. Units 2557–2580 are ex-Conrail units, but built to NS specifications. Some have been rebuilt as SD70ACC's. 68 SD70M units, numbered 2581–2648. 3 SD70M units, numbered 2797-2799. Units ex-New York, Susquehanna & Western 4050, 4052, 4054. Acquired in September 2014. 130 SD70M-2 units, numbered 2649–2778. 175 SD70ACe units, numbered 1000–1174. 1065-1074 painted in special historic "heritage" schemes honoring important NS predecessor roads. 50 SD70ACe/SD70IAC units, numbered 1175-1224. SD70IAC units are SD70ACe T4C units with IAC="Individual Axle Control" and are called SD70IAC by NS. 30 of 50 delivered. 10 SD70ACe-T4 units, numbered 2000-2009 on order. Delivery starts June 2019. 108 (eventually 110) SD70ACU units. Rebuilt from Ex-UP and Ex-CIT SD90MAC's, also known as SD9043MAC's. 20 SD70ACC's units, rebuilt from ex-NS SD70's. 27 units will be active by Q2-2019. 25 more units planned for rest of 2019. 2 SD70M-2 units, No. 4301 and 4302. See the section for Florida East Coast. 2 SD70ACe-P4 units, numbered 7001 & 7002. Units are ex-EMDX 1211 & 1212. 1,452 SD70M units, numbered 2001-2002, 3778–3984, 3986-4140, 4142-4689, 4692-5231 (Nos. 2001-2002 are ex 4690-4691, 3778 is ex 4141, renumbered for SD70ACe 4141, and No. 3985 is occupied by steam locomotive 3985). Unit 4014, along with 4884, was given the honor of escorting UP's 4-8-8-4 Big Boy move to Cheyenne for restoration, and eventual return to the active roster. To avoid confusion, the "Big Boy" was renumbered UPP 4014; the SD70M will be renumbered before the Big Boy re-enters service. Units 4530, 4545, 4687, 4811, 4855, 5070, and 4929 were wrecked and retired from service. Units 3974-3984 & 3986-3999 are ex-Southern Pacific 9800-9824. 518 SD70ACe units, numbered 1982, 1983, 1988, 1989, 1995, 1996, 4141, 8309-8378, 8380-8382, 8384-8395, 8397-8422, 8424-8823. The 19xx units comprise Union Pacific's "Heritage Fleet". Unit 1982 (ex-8379) wears the "Missouri Pacific Proud Heritage" livery. Unit 1983 (ex-8383) wears the "Western Pacific Proud Heritage" livery. Unit 1988 (ex-8396) wears the "Missouri-Kansas-Texas Proud Heritage" livery. Unit 1989 (ex-8521 (1st)) wears the "Denver & Rio Grande Western Proud Heritage" livery. Unit 1995 (ex-8522 (1st)) wears the "Chicago & North Western Proud Heritage" livery. Unit 1996 (ex-8523 (1st)) wears the "Southern Pacific Proud Heritage" livery; and was the locomotive to pull the "Big Boy" from its resting place at Pomona, CA. Unit 4141 (ex-8423) wears the "George Bush 41st President" livery. Numbers 8521-8523 were re-issued to subsequent new locomotives. 273 additional ACe units, numbered 8824-9096, were built in 2014 and 2016. 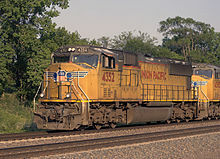 Classified by UP as SD70AH's they are ballasted to 428,000 lbs. instead of the standard 420,000 lbs. 8824-8996 were built in 2014, and Tier 4 credit units 8997-9096 were built in 2016. Unit 1943 (ex-9026) painted in a special paint scheme to honor U.S. troops. 100 SD70ACe-T4 units, numbered 3000-3099. When testing on other carriers is completed, former EMDX demonstrators 1502-1505, 1601, 1602, and 1605-1610 will become UP 3000-3011. UP 3012-3099 will be the first production units of this model. EMDX 1501 will be retained by Progress Rail Services as a test bed unit. EMDX 1603 and 1604 are "P4's" destined for BNSF Railway. 2 SD70M-2 units, No. 431 and 432. See the section for Florida East Coast. 14 SD70MAC units, numbered 9551-9564, all units are ex-Burlington Northern Railroad and later BNSF. 19 SD70ACe units, numbered 4831-4850, all units are former CSX . Some units are currently on lease to Canadian National Railway. 25 SD70M units, numbered 4675-4699, all units are former CSX and are also former EMDX demonstrators 7000-7024. Units are currently on lease to Union Pacific Railroad. In early 2019 Metra approved the purchase of 15 rebuilt SD70MAC locomotives, Progress Rail will take the existing locomotives and upgrade and configure them for passenger use. All components will either be refurbished, upgraded or new. The newly remanufactured locomotives will then be designated as SD70MAC-H locomotives. 15 units currently on order, with options for 27 more. 19 SD70ACe units, numbered 4324–4333 and 4347-4355. 4324-4333 were originally intended for BNSF Railway and purchased by BHP Billiton when on the production line. 173 SD70ACe/LCi units, numbered 4300–4323, 4334-4346 and 4356–4491 Some sold to MRL upon import to the U.S.
2 SD70 units, numbered 60 & 61. Assembled in April 1999, these were the last standard or "spartan" cab units produced by EMD, and were built as an add-on to Illinois Central SD70's 1020-1039, even matching their specifications. 55 SD70M units, numbered 701-755, (wide gauge 1,600 mm (5 ft 3 in)). 27 SD70AC units, numbered ??-? ?, (wide gauge 1,600 mm (5 ft 3 in)). 7 SD70ACe/45 units, numbered 618-624, (wide gauge 1,600 mm (5 ft 3 in)). 21 SD70ACe/45 units, numbered 9553-9573, (wide gauge 1,600 mm (5 ft 3 in)), operated by América Latina Logística. 62 SD70ACeBB units, numbered 8332-8393, (narrow gauge 1,000 mm (3 ft 3 3⁄8 in)), operate on the lines of Ferrovia Centro-Atlântica. An additional 16 locomotives should be delivered in the first half of 2017. 52 SD70ACe/45 units, numbered ??-? ?, (wide gauge 1,600 mm (5 ft 3 in)), operate on the lines of Ferrovia Centro-Atlântica and Ferrovia Norte-Sul. ^ Most other EMD six-axle locomotives were mounted on EMD's HT-C truck. ^ "Order # 946531, SD70M". The UNofficial EMD Homepage. Retrieved January 24, 2012. ^ "SD70M for CVRD". Electro-Motive Diesels. Archived from the original on May 15, 2008. Retrieved December 1, 2005. ^ "Diesel-Electric Locomotive SD70MAC" (PDF). Siemens. Archived from the original (PDF) on November 14, 2004. ^ "Locomotives Reference List" (PDF). Siemens. ^ a b ElectroMotive. "SD70ACe". Retrieved January 26, 2012. ^ ElectroMotive. "SD70M-2". Retrieved January 26, 2012. ^ "EMD ships first Tier 4 locomotive to Railway Interchange show". Trains Magazine. September 29, 2015. Retrieved September 30, 2015. ^ "EDM SD70ACe-T4 Freight Locomotive". www.progressrail.com. Retrieved January 7, 2016. ^ "EMD SD70ACe-T4 Locomotive". Progress Rail. Retrieved January 7, 2016. ^ "EMD unveils its first Tier 4 diesel locomotive". Railway Gazette. Retrieved July 27, 2016. ^ a b "BHP Billiton Iron Ore Road Locomotive Roster". Pilbara Railway Pages. Retrieved January 7, 2016. ^ "BHP Billiton places large heavy haul locomotive order". Railway Gazette International. 2 March 2012. Archived from the original on 14 March 2012. Retrieved 14 March 2012. ^ "Electro-Motive Diesel, Inc. Wins New Locomotive Contract for 25 SD70ACS Locomotives from Saudi Railway Company (SAR)". EMD. Retrieved January 7, 2016. ^ "High temperature locomotives ordered from EMD". Railway Gazette International. October 20, 2010. ^ "Etihad Rail orders EMD locomotives". Railway Gazette International. August 1, 2011. ^ "Alaska Railroad's Motive Power". The Diesel Shop. Retrieved January 24, 2012. ^ a b "Burlington Northern Santa Fe Motive Power Fleet". The Diesel Shop. Retrieved January 25, 2012. ^ a b c "Canadian National Motive Power Summary". The Diesel Shop. Retrieved January 25, 2012. ^ Belote, Joseph; Craig, R (January 23, 2012). "CIT Rail Resources". The Diesel Shop. Retrieved January 25, 2012. ^ a b Craig, R (January 23, 2012). "CSX Motive Power Summary". The Diesel Shop. Retrieved January 25, 2012. ^ Komanesky, John (January 17, 2012). "Ferrocarril Mexicano (Ferromex) Motive Power". The Diesel Shop. Retrieved January 25, 2012. ^ "Florida East Coast Motive Power". The Diesel Shop. November 16, 2008. Retrieved January 25, 2012. ^ a b "Kansas City Southern and KCS de Mexico (A Work-in-Progress)". The Diesel Shop. December 26, 2011. Retrieved January 24, 2012. ^ a b c d "Norfolk Southern Motive Power". The Diesel Shop. January 4, 2011. Retrieved January 24, 2012. ^ a b "Norfolk Southern Roster". NS Roster. April 1, 2019. Retrieved April 1, 2019. ^ a b c "Union Pacific Motive Power". The Diesel Shop. January 21, 2012. Retrieved January 25, 2012. Clark, Peter (2012). An Australian Locomotive Guide. Rosenberg Publishing. ISBN 978-1-921719-55-4. Montgomery, Richard (October 2009). "SD70ACe – brute power". The Westland. Bassendean, WA: Rail Heritage WA (263): 24–31. ISSN 1835-6370. Oberg, Leon (2010). Locomotives of Australia 1850s-2010s. Kenthurst: Rosenberg Publishing. ISBN 978-1-921719-01-1. Solomon, Brian (2006). EMD Locomotives. St. Paul, Minnesota: Voyageur Press. ISBN 978-0-7603-2396-0. Solomon, Brian (2011). Modern Diesel Power. Minneapolis, MN: Voyageur Press. ISBN 978-0-76-033943-5. McDonnell, Greg (2015). Locomotives: The Modern Diesel and Electric Reference (2nd ed.). Richmond Hill, Ontario: Boston Mills Press. ISBN 978-1-77085-609-7. Wikimedia Commons has media related to EMD SD70 series.